La Sportiva Berry Picker Trail Running Race Sunday Aug. 2 in Vail, Colo. The Vail Recreation District's 2015 La Sportiva Vail Mountain Trail Running Series continues Sunday with the Berry Picker 5k. This is the fifth race in the seven race series, which is presented by Anthem BlueCross BlueShield and Tiga Advertising. 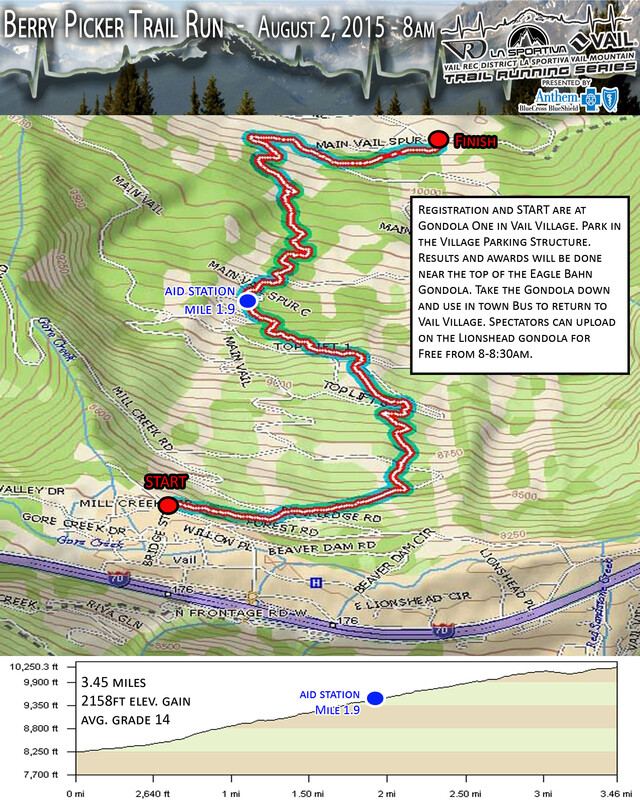 The race begins at 8 a.m. at the base of Gondola One in Vail Village, testing runners of all abilities on both single-track and double-track terrain over 3.4 miles of uphill running with an average grade of 14 percent. The race ends at Eagle's Nest at the top of Vail Mountain. There will be one aid station on-course at mile 1.6, complete with water, Gatorade and some snack items. The gondola will stop running at 8:30 a.m. and failure to load by 8:30 a.m. will result in waiting until the gondola reopens at 9:30 a.m. and paying for a one-day scenic gondola ride ticket. Post-race, the gondola will be free for racers and spectators to download back to Lionshead Village. Prizes will be presented to the top three finishers and overall finishers of each age group, both male and female.Series prizes are awarded to the top three finishers who compete in at least five events. La Sportiva will provide winners of each age category with a pair of mountain running shoes of their choice. Joining 2015 series title sponsor La Sportiva and presenting sponsor Anthem BlueCross Blue Shield are individual race sponsors TIGA Advertising, The Dusty Boot, Vail Valley Charitable Fund, FirstBank of Vail, Haute Route Gear & Apparel, Howard Head Sports Medicine and Vail's Mountain Haus. Partners also include Sports Authority, SmartWool, Vail Resorts, Beaver Creek Resort Company, The Steadman Clinic, Steadman Philippon Research Institute, Central Rockies Mortgage, Northside Coffee and Kitchen, Vail Mountain Coffee and Tea, Kind Design, AmericInn, Gatorade, Honey Stinger, KZYR 97.7, Optic Nerve, Skratch Labs, Oyster the Race and Camelbak. Visit www.vail.com or subscribe to the Vail e-newsletter and learn about upcoming events, vacation packages and lots of thing to do while you visit Vail.